Apple Cider Vinegar has been a staple in my kitchen for a few years now after I first started looking into it as a way to help some of my IBS symptoms, and I'm still in awe of the many benefits that this popular natural superstar has to offer. Apple Cider Vinegar is traditionally made from a blend of apples, yeast and a little sugar. The yeast helps to kickstart the fermentation process, and it's this stage which ensures a final result that is high in a number of minerals such as phosphorus, magnesium, potassium, and calcium, as well as producing levels of healthy bacteria. Although ACV has been used as a common remedy for various ailments over the centuries, it was the '70s that saw ACV have its moment in the mainstream that helped to solidify its status as a health product. Since then, the quality of some Apple Cider Vinegars has dropped to meet the increase in consumer demand, so it's important to pick one that's unpasteurised, GM-free, and with 'The Mother'. 'The Mother' is a strange sounding term that sounds like something from a horror film, but it's actually just all the good stuff that should be in your ACV. It's easy to spot because it gives a naturally cloudy appearance to the vinegar in the bottle (if you see an ACV that is crystal clear it's been filtered and pasteurised so it won't have 'The Mother'). 'The Mother' basically holds together all of the proteins, healthy bacteria, beneficial nutrients and acetic acid, and without it, you won't get anywhere near the number of proper benefits that ACV has to offer. Due to Apple Cider Vinegar being used so widely by so many people over the centuries, its name has become attached to virtually everything - from curing hiccups to fighting off certain types of cancer. Some of these claims have absolutely no substantial medical evidence to back them up, so I wanted to focus purely on the areas where ACV has helped me personally and what most people use ACV for. Here are my Top 5 Apple Cider Vinegar benefits! Thanks to the gut-friendly, healthy bacteria in ACV, it can help with things like indigestion and heartburn, as well as minor tummy upsets and some IBS symptoms like bloating, due to neutralising stomach acid. I find that it really helps to reduce the bloating aspect if I consume a teaspoon in a glass of water before having a meal. If you feel a sore throat coming on, mix a little ACV with warm water and gargle it. This seems to work as many of the germs causing the sore throat can't tolerate or survive after being dowsed with the acidic vinegar. The combination of healthy bacteria and acetic acid in ACV can help to stave off mild colds, and whenever your gut is in a healthy working state, your body as a whole can usually recover quicker from minor infections. If you eat a lot of carb-heavy meals, drinking a glass of water with 2-4 teaspoons of ACV helps to prevent blood sugar crashes and spikes, keeping your levels better balanced. It's not just internal benefits that you can reap from ACV. You can use ACV topically as it's naturally high in antibacterial and antifungal properties. I've used it as a facial toner before (diluted with water in a spritzer bottle) to fight off blemish breakouts during Summer, and it can keep your skin look clearer and smoother thanks to its natural exfoliating action. Due to its acidic potency, you must always, always, ALWAYS dilute your Apple Cider Vinegar. A good way to enjoy many of its benefits is to stir a teaspoon or two into a glass of water and drink it. 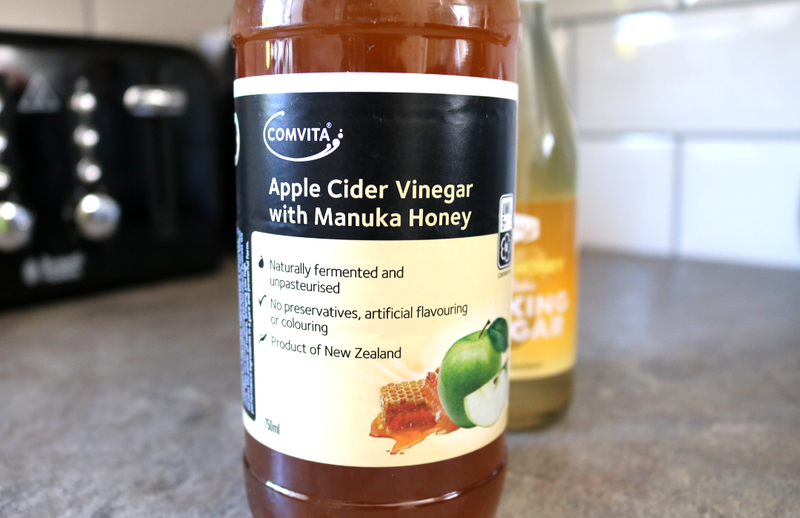 It does have an acquired taste though, so if you prefer something a little sweeter to take the sour edge of it slightly, you can try Comvita Apple Cider Vinegar with Manuka Honey* (750ml, £7.99, link). This one is a lot more palatable and makes a delicious salad dressing when mixed with a little olive oil! 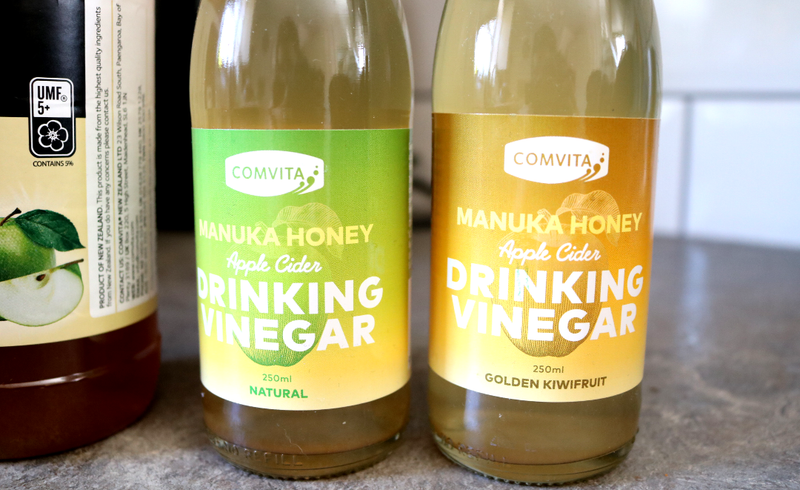 Whilst I was trying out the Comvita Apple Cider Vinegar, I also came across their Drinking Vinegars which are ready-to drink infusions of New Zealand Manuka Honey, Apple Cider Vinegar (with The Mother), and purified water. 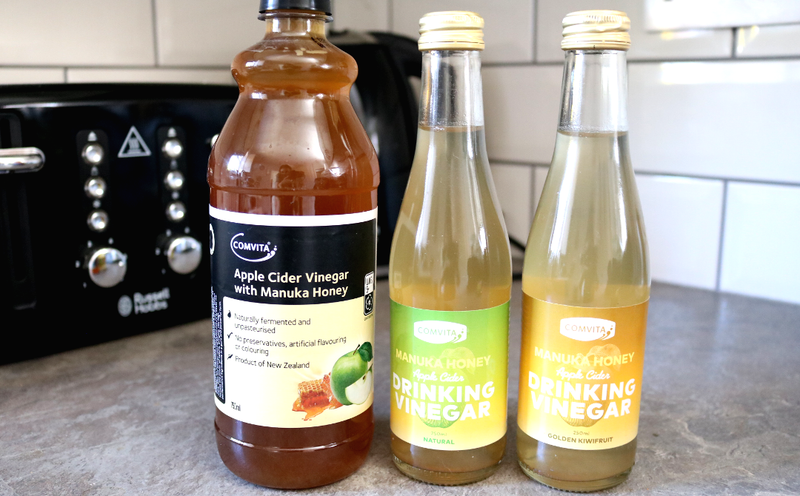 Each bottle contains two teaspoons of Apple Cider Vinegar and Manuka Honey, and it's still only 26 calories per drink. I tried two of the flavours, Natural and Golden Kiwifruit. Both of these are surprisingly refreshing, especially when they're ice cold, but they do have a light vinegary taste so they're a little tangy! Something to try out if you're looking for an all-natural drink with a difference though? Are you a fan of Apple Cider Vinegar?